There are four basic pain centers: 1: cerebro-spinal area, (nerve, lower back, cramping); 2: frontal lobe area, (ear, tooth and headaches over the eyes); 3: base of the brain (migraines, tension headaches); 4: abdomen, (menstrual cramping, digestive, elimination). Common paths to pain: Poor posture, poor nutrition, an acidic diet that eats away protective tissue, adrenal exhaustion, injury or surgery, tumors or growths, even repressed anger. All of us have suffered with some degree of pain in our lives, but did you know you can use your diet for pain relief, too? Here are some tips. 1. A vegetarian diet, low in fats, high in minerals is the best support for all kinds of pain - back and menstrual pain, migraines, arthritis, muscle aches. 2. Eat plenty of complex carbohydrates and vegetable proteins for strength: whole grains, broccoli, peas, brown rice, legumes, seafoods, etc. Fermented soy foods like tempeh, miso, natto and tofu are a specific for inflammation relief. 3. Add anthocyanin foods like cherries and berries as anti-inflammatories (often up to 10 times better than aspirin). 4. Add high mineral foods to the diet. Emphasize magnesium and calcium foods for muscle strength. Include bioflavonoid-rich foods, like fresh fruits and vegetables. 5. Have a vegetable drink like Knudsen’s Very Veggie or • Systems Strength broth mix, and a green leafy salad every day. Note: Dehydration worsens chronic pain. Be sure to drink 8 glasses of water daily. Try • Penta bottled water (highly recommended). 6. Avoid caffeine, salty and sugary foods to eliminate an overacid condition. • Acupressure: pinch and massage webs between the thumb and index finger. • Meditation is a proven pain killer. Just 20 minutes of meditation a day can completely change your perception of pain and even alleviate pain sensitivity. • Chiropractic adjustment, biofeedback, acupuncture, magnet therapy, and massage therapy control pain. • Prolotherapy injections help in reducing pain and improving range of motion. Contact American Assoc. of Orthopedic Medicine at 800-992-2063 for referral. • Pain-relieving compresses: Plantain-marshmallow; Wintergreen-cajeput oil; Comfrey leaf; Lobelia. PMS is by far the most common woman's health complaint. For some women, PMS is a minor inconvenience that lasts a few days. For others, it disrupts the whole month! A woman's body is delicately tuned, and can become unbalanced easily, causing pain, poor function, and a disconcerting feeling of not being "together," especially during the menstrual cycle. 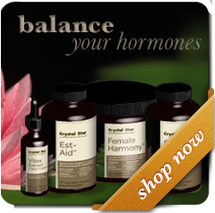 Fortunately, women can take relieve PMS effectively with a simple 4 point program. 1. Use essential fatty acids to balance prostaglandins. Prostaglandins are vital hormone-type compounds that regulate body functions almost like an electrical current. 2. Love your liver. The liver is in charge of hormone metabolism, and helps to rebalance estrogen and progesterone levels. 3. Enhance your thyroid to reduce PMS. Excess estrogen in the body is related to thyroid imbalance. If the thyroid does not have enough iodine, insufficient thyroid hormone is produced and too much estrogen builds up. Seaweeds are a good choice because they are rich in iodine. 4. Phytohormone-rich plants like soybeans, wild yam, licorice root and dong quai, help control PMS symptoms and have a safety record of centuries. An phytohormone-rich combination like works as a balancing resource to keep PMS symptoms at bay, naturally. A woman can expect a natural healing program for PMS relief to take at least two months, as the body works through both ovary cycles. The first month, there is a noticeable decrease in PMS symptoms; the second month often finds them dramatically reduced.